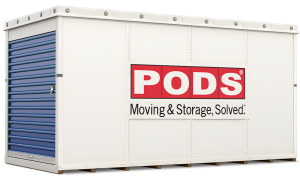 PODS is a new way to move and store at your own pace. PODS lets you take your time moving and storing your belongings. We deliver a PODS® container right to your door, you pack at your pace and we move it anywhere coast to coast. Moving and storage at PODS is made easier; we have two size containers for local storage. 8 ft wide, 8 ft tall and 12 or 16 ft long. If you are moving to or away from Santa Barbara counties we have two sizes 8X7X7 or 8X8X16. We customize the move to fit your budget. Our quoted price is guaranteed – no add ons – EVER! Your move is handled by our PODS staff, no contracted labor. Your moving and storage needs are handled by trained professionals. Once the PODS® container is loaded you put on your own lock and you keep the key. No one else will ever have access to it. You tell us when and where – 24 hour service guaranteed. With PODS, you will never have to work around OUR schedule. We bring it when you tell us to. You’re in control. You pack it when you get the time. No deadlines. We store it for as long as you need. Safe & secure. We move it for you across the street or across the country.